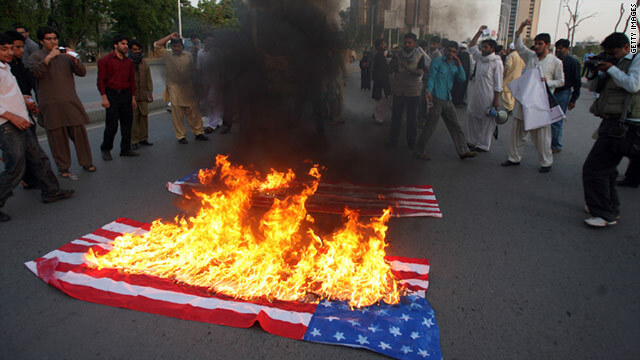 Pakistani Shiite students gather around burning U.S. flags during a protest in Islamabad on March 20. Editor's note: Since becoming CNN's State Department producer in 2000, Elise Labott has covered four secretaries of state and reported from more than 50 countries. Before joining CNN, she covered the United Nations. Follow her on Twitter at @eliselabottcnn. Washington (CNN) -- The death of Osama bin Laden could prove to be a turning point in United States-Pakistani counterterrorism cooperation. But whether it is for better or for worse remains to be seen. Ties between the two countries were at their lowest point in years before Sunday's attack on the compound where bin Laden was believed to be hiding for close to a year. Until recently, Pakistan offered tacit support for U.S. drone strikes in its tribal areas targeting al Qaeda and Taliban leaders. But the drone campaign, which was intensely unpopular among the Pakistani public, had increasingly become one of the main irritants in the relationship between the two countries. Islamabad was still seething over a January incident in which CIA contractor Raymond Davis shot and killed two Pakistan men who he claimed were trying to rob him. For its part, the U.S. has been frustrated over what it calls Pakistan's lukewarm action in going against extremists. Two weeks ago, Adm. Michael Mullen, chairman of the U.S. Joint Chiefs of Staff, said while in Pakistan that links between elements of the Pakistan Inter-Services Intelligence agency, or ISI, and Taliban factions in Afghanistan that target U.S. troops were straining relations. What's the future for the war on terror? On bin Laden, President Obama said Pakistan helped provide intelligence that led the U.S. to the terrorist leader and praised Pakistan for its "close counterterrorism cooperation" but said no other country, including Pakistan, knew about the operation in advance. Several Pakistani officials disputed Obama's account, claiming credit for what they called a joint U.S.-ISI operation. A senior Pakistani intelligence official said the U.S. intelligence was developed from information that the Pakistanis had gathered: mostly electronic intercepts that the source said the Pakistanis regularly provide to the U.S.
"Somehow it slipped from our radar and was picked up on theirs," the official said. The U.S. has long suspected that bin Laden was hiding in Pakistan, although officials suspected that he was given safe haven in the country's remote tribal areas along the border with Afghanistan. In July, while in Pakistan, Secretary of State Hillary Clinton accused the Pakistani government of not doing enough in the hunt for bin Laden, suggesting that the government knew where he was. The fact that bin Laden was found in a small city that is so close to the capital of Islamabad and home to the country's military academy raises more questions than answers about how he could avoid capture for so long. Did Pakistan's ISI, long believed to have ties to al Qaeda and the Taliban, provide bin Laden sanctuary in Abbottabad? Did it tip the U.S. off to his whereabouts? Or was the government completely ignorant that the world's most famous terrorist was living in the city? The answers to those questions are critical and will go a long way to determining the course of the relationship going forward. They could both confirm Washington's greatest concerns about Pakistan's commitment to fighting terrorism and deepen mistrust on both sides, or they will prove Pakistan to be a genuine partner in the fight against extremism, which could create goodwill on both sides and give the relationship a much-needed boost. For now, the U.S. and Pakistan are in a delicate dance, trying to put the most positive face on their relationship in the wake of such an historic development. The U.S. will claim that bin Laden's death vindicates its strategy of targeting extremists in Pakistan and argue that the unblinking eyes of drones probably helped the U.S. hunt down bin Laden. But given that drone strikes have been so unpopular in Pakistan, it could be a good time to stop them, now that the "head of the snake" has been cut off. That could limit any backlash or protests against the U.S. on the streets of Islamabad.